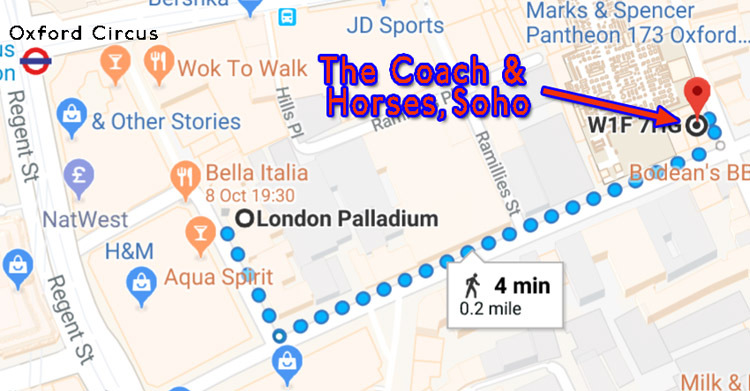 BtP nominates The Coach & Horses (Soho), a nice British pub, as a gathering-spot for Procol fans who fancy a drink and a chat before and/or after the music. It's a short, level, well-lit walk from the London Palladium. 'We're not your average pub. Not too traditional, not too pretentious - we specialise in authentic ales and proper food made with quality ingredients, served by top people in a cracking atmosphere. Our aim is one of inclusivity, not gentrification. We want to be a pub you can be proud of ...'. You can find them on FaceBook, if so inclined. There's no booking procedure ... just turn up and enjoy yourself. Before the show the downstairs (and outside, weather permitting) will be available, and food as well as a fine range of booze will be on offer. After the show BtP has in addition reserved the upper chamber with dedicated bar-person; this has a capacity of about fifty (note: this room is used for speed-dating earlier in the evening, thus being a no-go zone for the normal PH fan). Aftershow patrons please note: you'll have to get your drinks in by 11pm, because of local licensing laws, which are strictly enforced by Westminster Council.